4.82 points at 17 votes (rank 787). When you have collected all the cheese in the labyrinth, you reach the next round. With every round the number of cheese slices and the enemy mice is raised. Unfortunately, the black cats are not shown on the radar. The design is kept very simple. 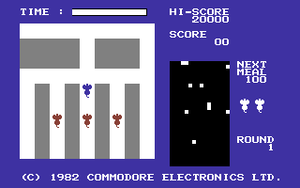 The actual game takes place in the left window, which only uses half of the screen. Through this the sight is very limited. The radar window is even smaller, this makes everything look a bit lost. The mice, cats, the cheese and the walls in the labyrinth are only displayed stylistically. In the upper line you see the time that is left, to the right of that the current highscore. 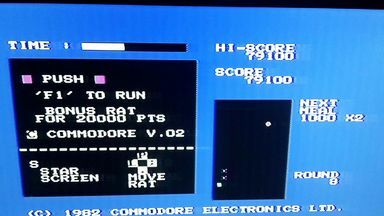 Directly below the highscore the current score is displayed. 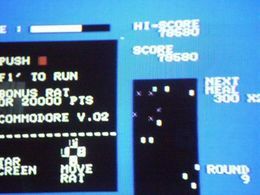 To the right of the radar screen the current number of points, which you will receive for the next slice of cheese collected, is displayed, below that the number of lives left and the current round. During the game a simple melody constantly plays in the background. The collecting of cheese, crashes, the succesful finish of a level and the use of the Star Screens are accompanied by effects. For the first slice of cheese that you pick up there are 100 points, for the second 200 points and so on. If you lose a life, the counting starts again at 100 and is shown at the right of the radar screen (Next Meal). If you collect the slice of cheese with "2x" written on it, you will receive twice the points that are displayed when collecting the next slice of cheese. When a round is finished, the time left is converted to points. Every 20.000 points you get an extra life. When the time is over, the player is abruptly stopped, whereupon he gets hit by a red mouse most of the time. Try to memorize the build-up of the labyrinth, as there are places that have only one entrance and you can easily get trapped. If you have to enter such a place, you should scatter "Star Screens" in front of the entrance. The version by "Commo Bam" offers unlimited lives as trainer. 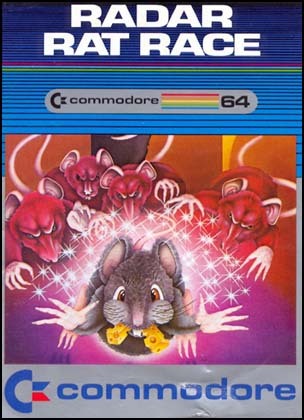 Camailleon: "The music is a bit nerving, but the game principle is rather nice and the design of the little mice also. Unfortunately, the difficulty level is a bit too high for me, as the enemy mice are quickly close on your heels and the sight is very limited." 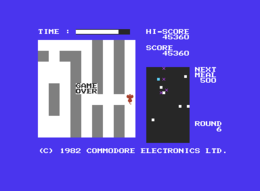 Robotron2084: "Doodelydo-doodelydo-doodoodoo, Doodelydo-doodelydo-doodoodoo,Doodelydo-doodelydo-doodoodoo, doodoodoo-doodoodoo-doodoodoo! UAAAAH!!!" Telespielator: "Really reminds me of RALLY-X by Namco...! :D"
mombasajoe: "One of the worst pieces of software that I have ever deleted." Shakermaker303: "It is not thaaat bad, for the year 1982 it is just bearable. Well, it gets boring rather quickly." 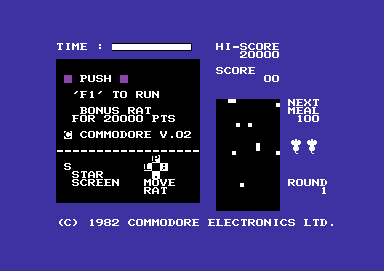 blubarju: "There are better games by Commodore. But this game is rather nerving. Even though the game idea is quite nice. Only 3 points from me." Borna: "Guys, you are totally wrong. This game was the second cartridge (!) of my big brother and it seemed to me gigantic in its dimensions. The speedruns were great and the variations in the levels add to the diversion. The only point of critique was the intensly rising difficulty level and the maybe a bit nerving music. But at that time we thought that was fantastic, be honest." SkinnyNorris: The music is great, even after over 20 years it has burned itself into the ear canals!!! What a recognition value! Dedoodely-doodely-doodoodoo, Dedoodely-doodely-doodoodoo,Dedoodely-doodely-doodoodoo, doodoo-doodoo-doodoo!" This page was last modified on 17 September 2018, at 12:23.